Ontario Peak stands at 8693 feet and uniquely offers amazing vistas of both the vast human sprawl to the south and stunning beauty of San Gabriel Mountains' highest peaks to the north. En route you'll enjoy the immensely popular Icehouse Canyon with its charming cabins, gurgling stream, soaring cliffs, and forested slopes. You can drink from the cool, refreshing waters of Columbine Spring. You'll pass through Icehouse Saddlethe "Grand Central Station" of this high country, and pay a visit to historic Kelly Camp. 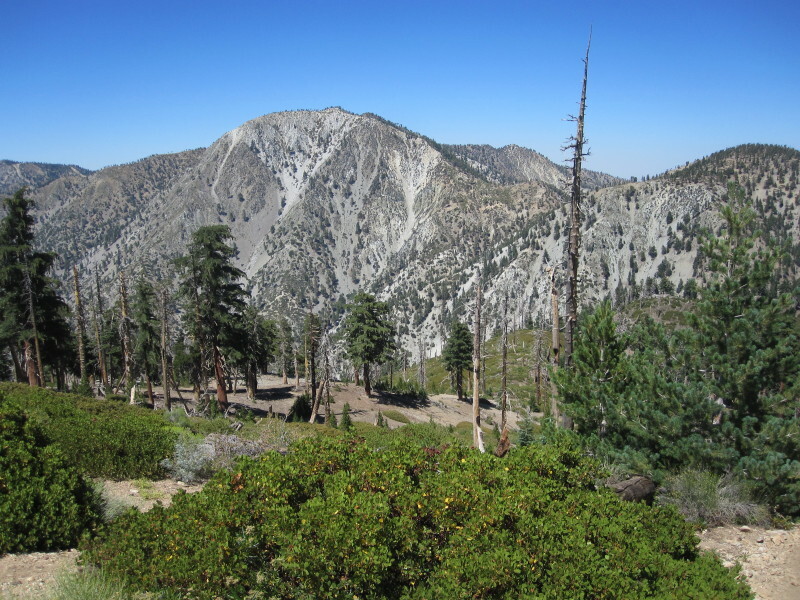 Most of your hike lies within the Cucamonga Wilderness12,781 acres of pristine high country dominated by 8,000-foot peaks, deep canyons, and rich conifer forest. And you will traverse through bighorn sheep territory, so you may experience some of these magnificent creatures. And you may encounter deer, bear, and rattlesnakes...and certainly chip monks. The hike is 12.4 miles round trip and 3,733 feet in elevation gain, which requires that you be in good hiking condition. 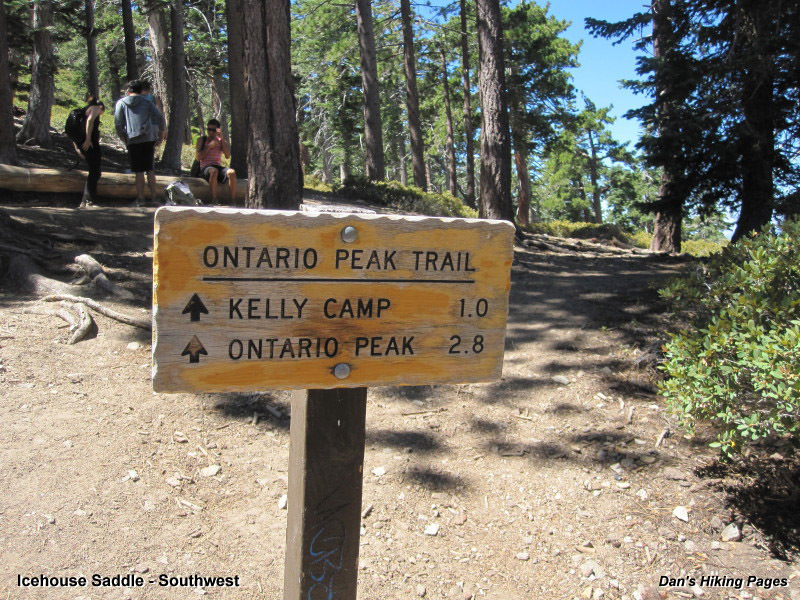 If you would like to break it up as a two-day hike, you have two primary options for overnighting: Kelly Camp and Ontario Peak. 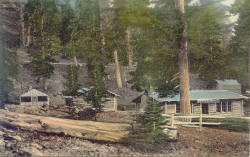 Kelly Camp is an unimproved wilderness camp site with lots of history. 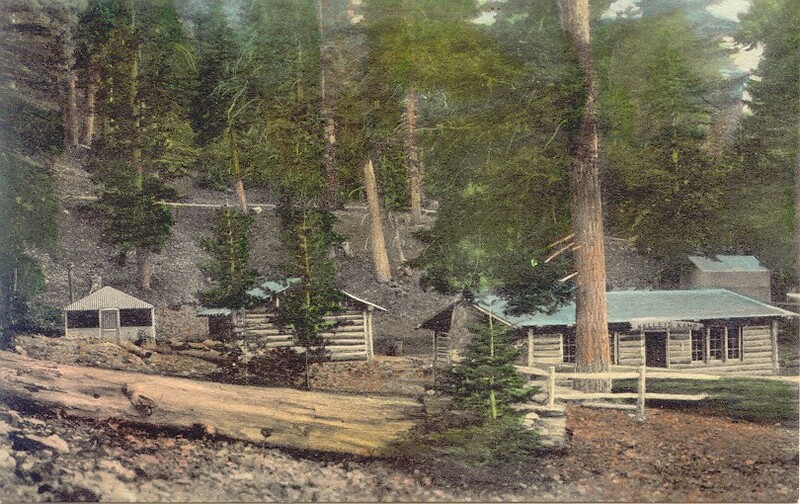 John Robinson writes that Kelly Camp was established as a mining prospect by John Kelly in 1905 and was turned into a trail resort by Henry Delker in 1922. All that is left today are some foundations. This is a popular campsite, so if you camp there you may be sharing it with others, particularly on a weekend. There is a spring there also but it is not reliable. The other primary camping option is Ontario Peak. About 150 yards before the summit is a flat area ideal for overnighting. It offers splendid sunset and sunrise experiences and spectacular nighttime views over Pomona Valley twinkling with a billion lights. I had a delightful stay there in a mid August (read my blog post). Note, however, that it can get quite windy near the summit and along the ridge. This is a great summer hike with plenty of sunshine, pleasant temperatures, and long days. But check the weather reports for possible thunderstorms and make sure you carry the 10 essentials. The higher elevations can get a lot of snow in the winter, so check the trail conditions if you're hiking late fall or early spring. Even on a warm summer day, wind can be cold, so be prepared. 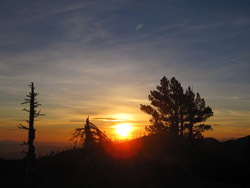 See Seasons of the San Gabriels for a detailed description of minding the seasons. From the 210 Freeway extension, driving east: Exit Baseline Road in Claremont. Turn left on Baseline. In one block turn right unto Padua Avenue. In 1.7 miles turn right onto Mt. Baldy Road (stop sign). After 7.2 miles you pass the Angles National Forest Mt. Baldy Visitor Center in Mt. Baldy Village. You can get a Forest Adventure Pass and wilderness permit here. Continue 1.5 miles to the Icehouse Canyon entrance. As the road turns left, veer right and in about 100 yards turn left and park in the large parking area. From the 210 Freeway extension, driving west: In Upland, exit Mountain Ave./Mt. Baldy Exit, Exit 54. Turn right and proceed north on Mountain Ave. Drive 5 miles to Mt. Baldy Road. Turn right (north) and after 5 miles you pass the Angles National Forest Mt. Baldy Visitor Center in Mt. Baldy Village. You can get a Forest Adventure Pass and wilderness permit here. Continue 1.5 miles to the Icehouse Canyon entrance. As the road turns left, veer right and in about 100 yards turn left and park in the large parking area. 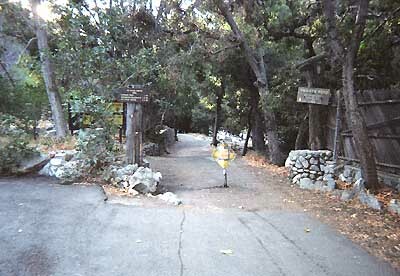 The trail starts at the east end of the large parking lot, just to the right of the ruins to the old Icehouse Canyon Resort. A National Forest Adventure Pass is required for parking. The parking lot can get full on weekends. From the trailhead follow the path east as it heads up the heart of scenic Icehouse Canyon. You'll enjoy the shade of oak, alder, spruce, cedar, fir, and pine. A few old cabins and cabin ruins dot the route. The year-around creek on your right delightfully splashes and gurgles. 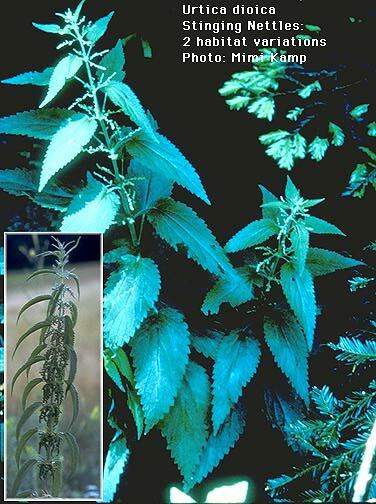 Stinging nettles hug the path in spots, so be alert. After 1.0 mile you reach the junction of Chapman Trail on the left. Continue straight on Icehouse Canyon Trail. 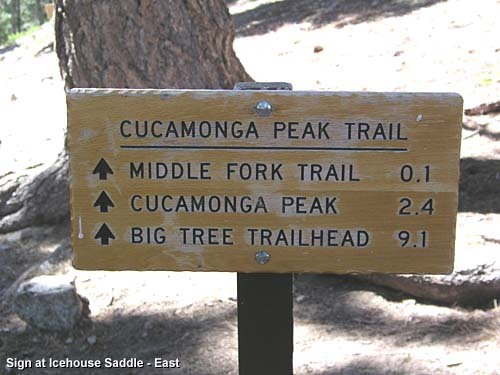 After 1.8 miles from the start you reach the signed entrance to the Cucamonga Wilderness. The forest is more open at this point as you enjoy expanding views. The precipitous canyon walls towering above you on the south are particularly striking. The trail gets steeper and at 2.4 miles you are greeted by the refreshing water of Columbine Spring, high on the north slope above the canyon floor. After the spring you'll do some more switchbacking. Just shy of 3 miles from the start you reach the upper junction of Chapman Trail. Continue up canyon (right) and after another half mile you'll reach Icehouse Saddle (3.6 miles). View northeast from Ontario Peak Trail toward Telegraph Peak. 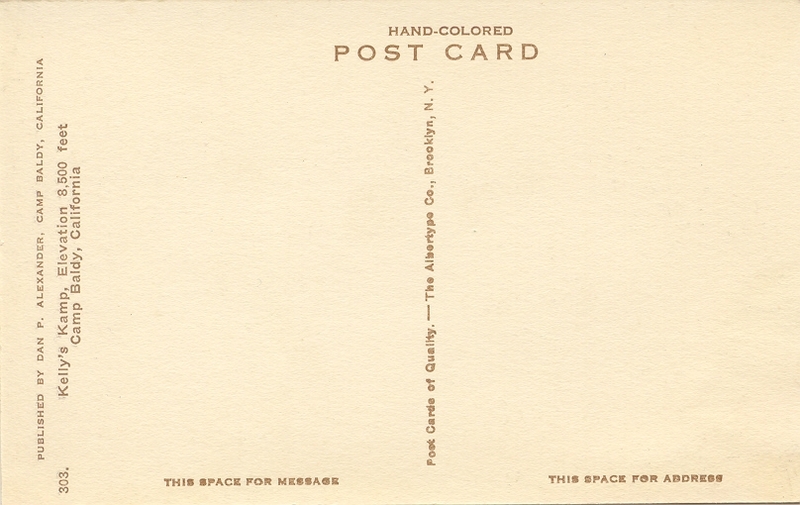 View Large Image. From the saddle, trails emanate in five directions. To the left, Three T's Trail heads north toward Baldy Notch. Straight ahead and veering to the right is Cucamonga Peak Trail heading southeast. And branching left off that trail in about 30 yards is Middle Fork Trail heading east into Lytle Creek. To the right, Ontario Peak Trail heads southwest. This is your route. The 1.0 mile from Icehouse Saddle to Kelly Camp is a gentle ascent, gains only 260 feet. The expanding view to the north provides a striking look at Timber Mt., Telegraph Peak, and Mt. Baldy. If you look carefully you can see Chapman Trail cutting across the north flank of Timber Mt. 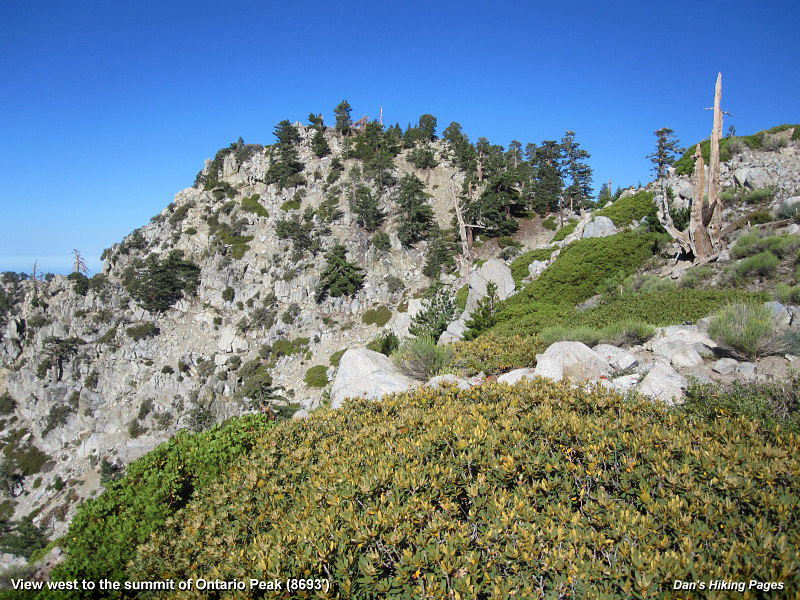 You'll pass over a spur ridge as you enter upper Delker Canyon and get your first view of Ontario Ridge. A little more walking will deliver you to Kelly Camp (8740'). Keep in mind that in spite of make-shift fire rings, open fires are not allowed in the wilderness, and camp stoves are by permit only. As you enter the site, notice that the trail splits. To your right (west) and about 150 yards you will find the springa pipe dripping into a little catch basin. If you are going to rely on it for water, you may want to check the discussion boards and blogs before hand to see if it's running. The other option back at the fork veers left (south). This is your route. The trail conveniently goes up the steps of a cabin foundation and climbs south zigzagging through the trees. In a few minutes you transition from a shady forest to an open bowl which had been incinerated by 1980 fire leaving a toothpick forest. The low point on the ridge is where the trail is heading. Looking west toward the summit of Ontario Peak (8693'). View Large Image. At 0.4 mile from Kelly Camp, you reach Ontario Ridge. Here you are rewarded with striking views south toward the human sprawl of Pomona Valley and beyond. The trail on the left heads east along the ridge to Bighorn Peak, 0.7 mile away (see below for a description of adding Bighorn Peak to your hike). Turn right (west). The trails contours around the north flank of a large bulge on the ridge and shortly you find yourself back near the ridge. A short side jaunt of a few yards will reward you with more views south. Continue following the trail as it contours around the north flank of yet another large bulge on the ridge. When you get to the hip, the summit of Ontario Peak comes strikingly into view as a rocky mass dominating the ridge not far to the west. Your trail now climbs south zigzaging a series of switchbacks. Shortly your trail arrives near the ridge again for more views south if you take a short side jaunt. The fractured, rugged terrain of the steep southern walls is amazing. The trail now more closely follows the ridge line in its approach to the summit. The "toothpick" forest is a stark reminder of the destructive fire. Shortly you reach the foot of the final pitch to Ontario Peak. The trail climbs steeply a zigzagging route and in a few minutes begins to level out and you continue another 150 yards ahead to the Ontario Peak summit. Climb around the large boulders on the peak to archive views in all directions. On a clear day the panorama is spectacular. Even on a day with hazy skies you may be able to see all the way to the Palos Verdes Peninsula and the Channel Islands beyond. If you bring a street map of the Pomona Valley and/or the Greater Los Angeles area, you may enjoy picking out various landmarks. Binoculars are a nice accessory to have on this hike. This peak has to rival any peak in the San Gabriels for numbers of peaks in view; I identified 35 (see list below under notes). 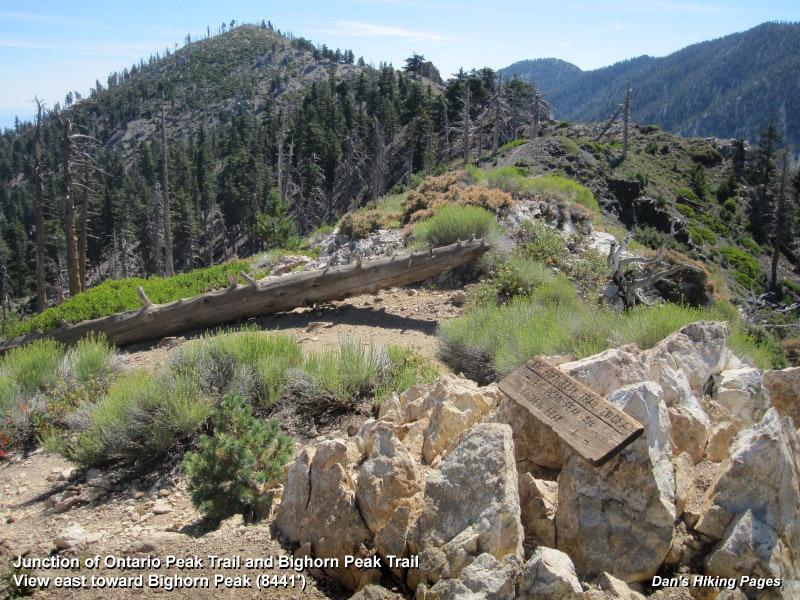 Bighorn Peak (8441'): Here's how to add this splendid summit to your hike for an additional 1.4 round-trip miles: From the junction (8400') on Ontario Ridge 0.4 mile above Kelly Camp, turn left (east) unto Bighorn Peak Trail. Follow the trail as it traverses generally on or below the ridge. You'll pass to the north of a craggy outcropping (8210'). The route then dips down about 300 feet to a brush-choked saddle at the head of Delker Canyon before it begins its final 340-foot climb to the summit, 0.7 mile from the junction. Some places may challenge your route finding. This is Nelson bighorn sheep territory, so respect their habitat and relish any sightings you may have of these magnificent creatures. The sweeping panorama from the summit of Bighorn Peak is breathtaking. As an option, a cross-country route is doable from Icehouse Saddle directly up the south ridge then bending west for the final ascent to the summit (climbing about 0.6 mile with 860 feet in elevation gain). Keep in mind that this route is cross-county, is steep, has no clear path, is quite brushy at the lower end, and should be attempted only by experienced hikers in good condition and with off-trail skills. 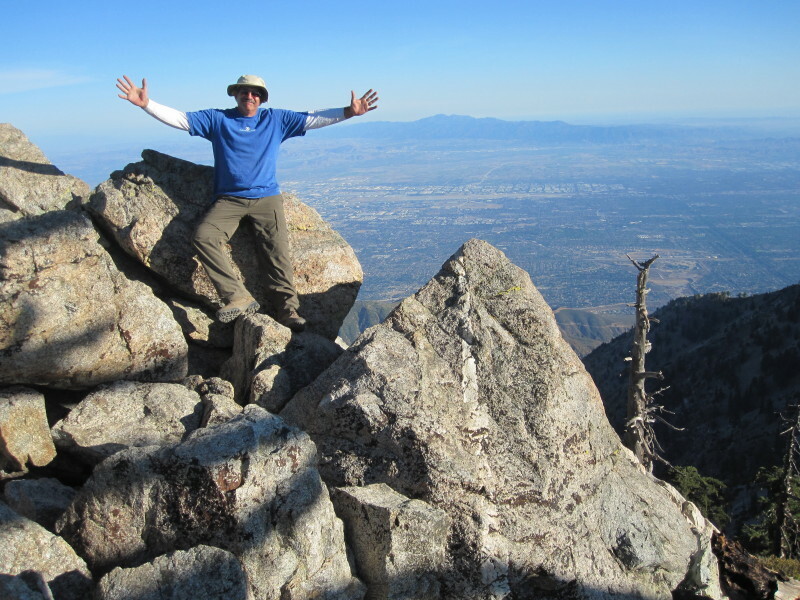 Read about my Bighorn Peak hike (8-28-12). 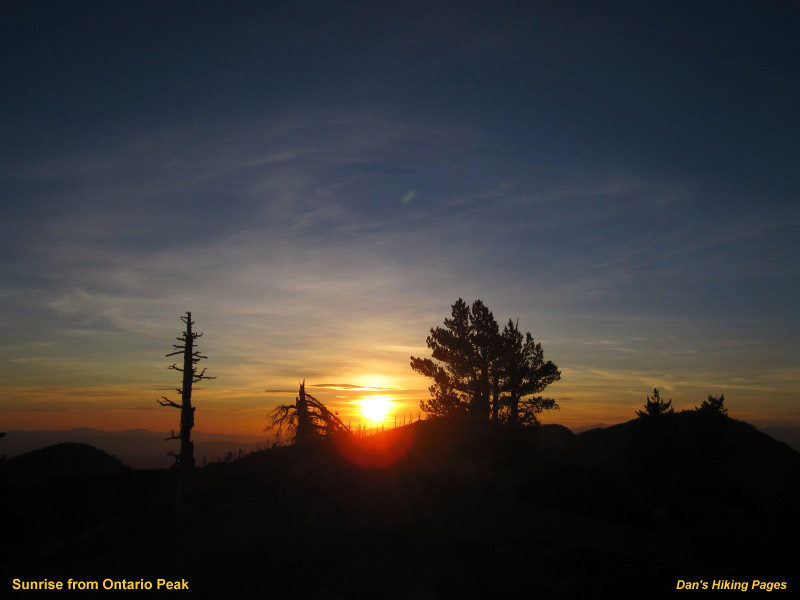 Peaks in View: Ontario Peak has to rival any peak in the San Gabriels for numbers of San Gabriels' peaks in view: Colver Peak, Sunset Peak, Glendora Mt., Glendora Peak, Azusa Peak, Mt. Bliss, Monrovia Peak, Silver Mt., Pine Mt., Mt. Wilson, Mt. Markam, San Gabriel Peak, Mt. Lawlor, Strawberry Peak, Twin Peaks, Mt. Waterman, Smith Mt., South Hawkins, Middle Hawkins, Sadie Hawkins, Mt. Hawkins, Troop Peak, Mt. Burnham, Mt. Baden-Powell, Lookout Mt., Rattlesnake Peak, Iron Mt., Mt. Baldy, Mt. Harwood, Thunder Mt., Telegraph Peak, Timber Mt., Bighorn Peak, Etiwanda Peak, and Cucamonga Peak. And there's probably more. Trail conditions: This classic, hand-built, single-track trail is well traveled and usually in reasonable condition. In the first couple miles, much of the trail surface has uneven footing and loose rocks, fallen from the steep scree slopes or along the route where the trail follows over or near the creek bed. Along Ontario Peak Trail from Icehouse Saddle to Ontario Ridge, there are places where the brush hugs the trail pretty closely as of my last hike. Permits: A National Forest Adventure Pass is required for parking. A wilderness permit is required to enter the Cucamonga Wilderness. You can obtain both from the National Forest visitor's center in Mt. Baldy Village (909-982-2829). If you are planning to hit the trail before 8:00 AM, you can call the visitor's center the day before and ask for a permit. They'll pin it on the bulletin board out front and you can pick it up in the morning, in route to the trailhead. Mileage: As with most hikes in the San Gabriels, there are discrepancies between sources as to mileage. 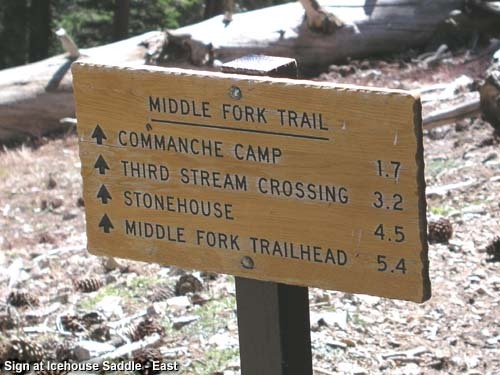 For the sake of consistency and based on reasonable assumptions, I've used the mileage from the Forest Service signage and the Tom Harrison maps, with some slight massaging. 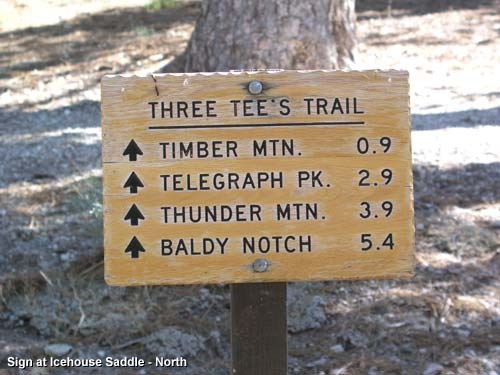 Harrison puts the distance to Icehouse Saddle at 3.4 miles whereas the trail sign puts it as 3.6. I'm taking the average of 3.5 (which is the mileage that Jerry Schad uses). Harrison's mileage from Icehouse Saddle to Ontario Peak is 2.7 while the sign is 2.8; I'm using 2.7. For a total distance from Icehouse Saddle to Ontario Peak I'm using 6.2 miles. Elevations: My earlier hike descriptions out of Icehouse Canyon used the elevations from the Tom Harrison Angeles High Country Map, 2002. In the 2011 edition of that map and the Mt. 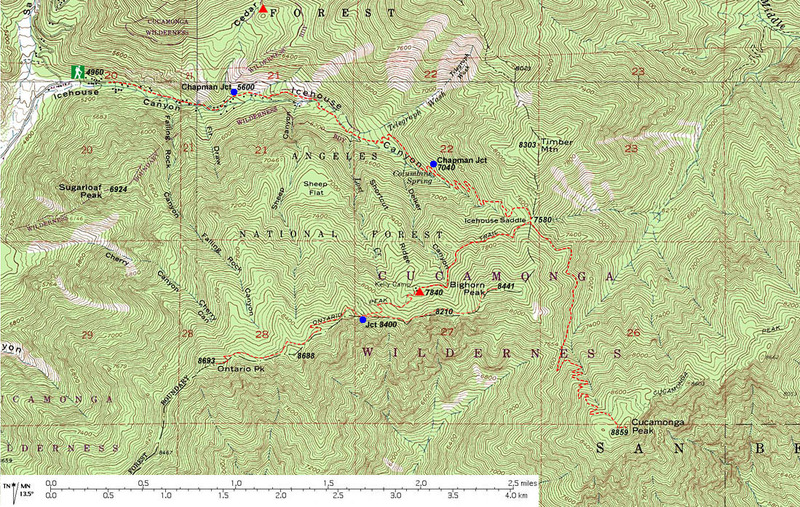 Baldy & Cucamonga Wilderness Trail Map, 2009, the various elevations were changed as per the following: Icehouse Canyon TH	- 4900	to 4960 (+60) Chapman Junction	- 5550	to 5600 (+50) Cedar Glen Tr. Camp - 6320	to 6400 (+80) Chapman Junction	- 7120	to 7040 (-80) Icehouse Saddle	- 7555	to 7580 (+25) Bighorn Junction	- 8300	to 8400 (+100). People traffic: Icehouse Canyon Trail is immensely popular, one of the busiest in the San Gabriel Mountains. On a typical weekend day there are dozens and dozens, sometimes hundreds of hikers. Even on a weekday you will share the trail with others. The numbers thin out as you get higher, since the lower portion of the trail is used a lot by casual walkers and families with children. Once you transition to Ontario Peak Trail, you may have the trail mostly to yourself, particularly on a weekday. The authoritative source is the U.S. Geological Survey. Their official listing is "Kelly Camp." The standard practice of the USGS is to drop the possessive apostrophe in geographic names (thus Pikes Peak, Devils Backbone, etc.). The U.S. Board on Geographic Names states, "Since its inception in 1890, the U.S. Board on Geographic Names has discouraged the use of the possessive formthe genitive apostrophe and the "s". The possessive form using an "s" is allowed, but the apostrophe is almost always removed" (geonames.usgs.gov FAQ #18). Contrary to USGS policy, John Robinson opted for "Kelly's Camp" in his 9th Edition (2013). In corresponding with Doug Christiansen (Robinson's coauthor) prior to the release of that edition, I cited the USGS position, however, Robinson's reply was, "Kelly was one man. So Kelly's Camp should be used." I've opted to follow the USGS and use "Kelly Camp." Hundred Peaks Section, Angeles Chapter, Sierra Club Peak 17B "Ontario Peak" - Brief driving directions and route description. Brief historical background of the peak name. Puts r.t. distance at 12.0 miles with 3700' gain. LocalHikes.com - "Ontario Peak" - by Allen Riedel. Bare-bones hike summary. 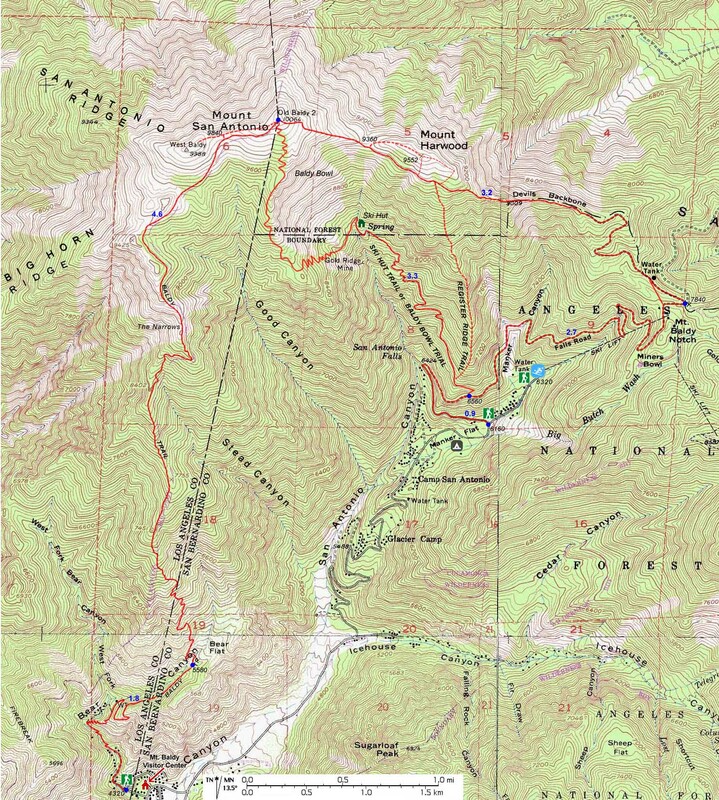 Directions to trailhead, topo map (very small), 4 photos. As typical with many hikes posted at LocalHikes, this description is virtually useless to accurately guide the hiker on the route (I've specifically not included the link here because I don't want to drive traffic to it). The most helpful part of this page is the trail reviews from different hikers. Trails of the Angeles: 100 Hikes in the San Gabriels - by John Robinson with Doug Christiansen (Wilderness Press: Berkley, 8th Edition, 2005). Hike 97: "Icehouse Canyon to Icehouse Saddle, Kellys Camp, Ontario Peak" - Good trail description, although somewhat abbreviated, with historical background. Puts distance at 13 miles round trip with 3,600 feet gain. In the 9th Edition (2013), they revised the distance to 12 miles with 3,800 feet in gain. They also renumbered the hikes, so this is now Hike 98. Afoot and Afield in Los Angeles County - by Jerry Schad (Wilderness Press: Berkley). 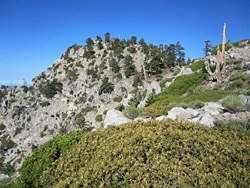 Area A-12, Trip 5: "Cucamonga Peak." Good trail descriptions with historical background. Only the part to Icehouse Saddle applies to this present hike. Puts distance to saddle at 3.5 miles. Los Angeles County: A Day Hiker's Guide - by John McKinney (The Trailmaster, 2006). 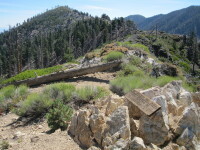 "Icehouse Canyon" Good trail description and historical highlights. Only the part to Icehouse Saddle applies to this present hike. Puts distance to saddle at 4.0 miles (probably 0.4 mile too much). This page was last updated August 8, 2014.